Newswise, January 3, 2017 — Scientists at Washington University School of Medicine in St. Louis have detailed the structure of a molecule that has been implicated in Alzheimer’s disease. Knowing the shape of the molecule — and how that shape may be disrupted by certain genetic mutations — can help in understanding how Alzheimer’s and other neurodegenerative diseases develop and how to prevent and treat them. The idea that the molecule TREM2 is involved in cognitive decline — the hallmark of neurodegenerative diseases, including Alzheimer’s — has gained considerable support in recent years. Past studies have demonstrated that certain mutations that alter the structure of TREM2 are associated with an increased risk of developing late-onset Alzheimer’s, frontal temporal dementia, Parkinson’s disease and sporadic amyotrophic lateral sclerosis (ALS). Other TREM2 mutations are linked to Nasu-Hakola disease, a rare inherited condition that causes progressive dementia and death in most patients by age 50. “We don’t know exactly what dysfunctional TREM2 does to contribute to neurodegeneration, but we know inflammation is the common thread in all these conditions,” said senior author Thomas J. Brett, PhD, an assistant professor of medicine. The analysis of TREM2 structure, completed by first author, Daniel L. Kober, a doctoral student in Brett’s lab, revealed that the mutations associated with Alzheimer’s alter the surface of the protein, while those linked to Nasu-Hakola influence the “guts” of the protein. The difference in location could explain the severity of Nasu-Hakula, in which signs of dementia begin in young adulthood. The internal mutations totally disrupt the structure of TREM2, resulting in fewer TREM2 molecules. 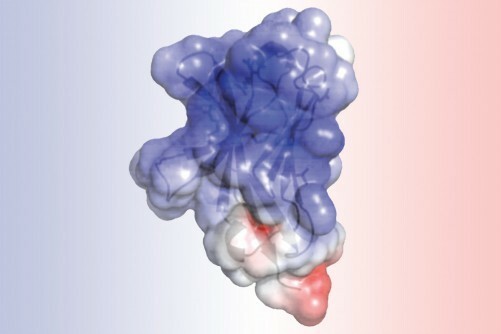 The surface mutations, in contrast, leave TREM2 intact but likely make it harder for the molecule to connect to proteins or send signals as normal TREM2 molecules would. TREM2 lies on the surface of immune cells called microglia, which are thought to be important “housekeeping” cells. Via a process called phagocytosis, such cells are responsible for engulfing and cleaning up cellular waste, including the amyloid beta that is known to accumulate in Alzheimer’s disease. If the microglia lack TREM2, or the TREM2 that is present doesn’t function properly, the cellular housekeepers can’t perform their cleanup tasks.